Guinea pigs (or Cavies as they are also known) make wonderful pets. They are best kept in pairs as one guinea pig gets very lonely. They are very vocal animals and need a companion to talk to. It is best to have two sisters or two brothers if they are unneutered, however we neuter all our animals therefore we can pair male and female together and we believe that is the perfect pairing. If you are going to buy your animal from a pet shop, (which we do not recommend as often the sales assistants know very little if anything at all about the animals) do make sure that you take your animals along to the Vets to have a health check and to have the gender of the animals confirmed. DO NOT under any circumstances house a guinea pig with a rabbit. The two will almost certainly get along for the first few months but when the rabbit reaches sexual maturity it will molest the guinea pig, resulting in injury and even death. Another factor to consider is that rabbits and guinea pigs require different diets. An adult guinea pig can grow to a maximum of twelve inches and can weigh from twenty eight to thirty five ounces. Guinea pigs have a higher temperature than humans therefore can feel quite warm to touch, temperatures of 103 F are not uncommon. They have four claws on the front feet and three on the back feet, but four on the back feet is often seen. Guinea pigs have teeth that grow constantly giving them a healthy diet will help keep these teeth in shape. If the right diet is not provided the teeth can become overgrown and will eventually stop your guinea pigs from eating. This is called Malocclusion. Your Vet will be able to trim the teeth or better still remove them altogether. Guinea pigs like rabbits survive very well without their incisors. They are able to pick food up with their tongue and transfer it to the back teeth for chewing. However they cannot form a bite so you will have to chop fresh foods into small pieces for them. 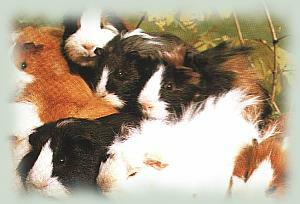 There are many different breeds of guinea pig but the majority that come into rescue centres are mixed-breed. If you choose a longhaired variety you must be aware that it will need grooming every day throughout its life or it will become very badly matted. 1) The animal is alert, energetic and moves freely. Avoid animals that sit huddled in the Corner. 2) The eyes are dry and bright. 3) The ears are clean and dry without discharge or dirt. 4) The rear is clean and dry, not soiled or wet. 5) The top teeth fit snugly over the bottom teeth when the mouth is closed. 6) The hair is clean and shiny, the skin underneath the coat is not scurfy or scabby. 7) If possible ask to see the parents so that you have an idea what the animal will grow into. Only purchase an animal that you are perfectly happy with. If in doubt look elsewhere. Set aside time each week to spend extra time with your guinea pigs to give them a healthcheck. Check all the points mentioned on this Website, if you are unhappy or worried about anything that you find take your animals along to the Vets for a check up. Remember the earlier the diagnosis the better the chances of a full recovery. We do hope we have given you the basic information that you will need to care for your guinea pigs. A happy, healthy guinea pig is a joy to have. You will soon learn what all the different chatters and whistles mean and be able to communicate with them. The gestation period for a guinea pig is approximately 67 - 72 days. The piglets are born fully furred and fully functional, within a couple of hours they are nibbling veggies and eating solids. Guinea pigs are sexually mature at the age of just six weeks so should be separated accordingly. The life span of a guinea pig is approximately seven years you should bear this in mind when making your purchase. A female guinea pig could well produce five litters a year. Finding good homes for so many offspring can be a major problem, so the golden rule about breeding from pet guinea pigs is: DON'T. As a general rule it is inadvisable to breed from young females of any species who may have reached puberty but who are too immature in behaviour to deal with their own young patiently and competently. The same applies if they are too physically immature for the pelvis to have reached an adequate size to prevent pain and difficulty dystocia during the birth process. The case of the guinea pig is rather different. There may be a greater risk of dystocia if the guinea pig does not have her first litter while she is still young. Once fully grown, the pelvic bones fuse, leaving her with a rigid, perhaps under-sized pelvis, and this may cause difficult births and a shorter breeding span than normal, so for this reason don't try and breed from sow's over 6 months old. Pregnant females drink thirstily and will take milk as well as water. Their diet must be increased to support the unborn or suckling young and if there are more than three in the litter they will need extra milk since she has only two mammary glands. It has already been said that guinea pigs are intolerant of low temperatures, and are liable to suffer heat exhaustion. A heavily pregnant sow is particularly vulnerable in this respect. If she is kept in a hutch it must be moved to a shady position and hosed with cold water. Many owners find it advisable to house a pregnant sow alone for a week or two before her litter is due, because she needs very careful handling and quiet conditions then, and leave her alone to bring up her family until weaning age. If the boar were left with the sow she would be likely to become pregnant again immediately after giving birth. In an emergency expert veterinary advice should be sought urgently, but it is important meanwhile to handle the guinea pig correctly and do the right thing to speed its treatment. Generally, the animal should be kept warm and prevented from dehydrating. When the guinea pig is very cold, a small drop of whisky is an invaluable reviver. Accidents Probably for a suspected fracture the vet will want the guinea pig brought to the surgery rather than make a house call, so ask how to move the guinea pig safely, without aggravating its problem. Heat stroke Confined to small, badly ventilated hutches or left in direct sunlight from which they cannot escape, guinea pigs are very prone to heat stroke. If an animal is found in obvious and acute distress, possibly in a state of collapse its back must be wetted immediately with a damp cloth and the animal removed at once to a cool place with good ventilation. It should be fanned if severely affected. Wounds Torn ears, sore hocks, and skin abrasion may be the result of keeping incompatible guinea pigs together. Consult Veterinary surgeon if the wound is serious, or becomes infected. But otherwise bath in a saline solution. Keep males apart. 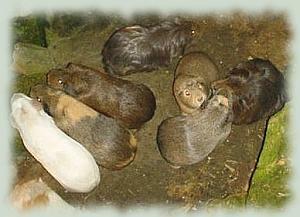 And separate females if they constantly fight and kick normally compatible guinea pigs may fight when overcrowded. Abscesses occur quite frequently as a result of a wound and must be lanced by the vet when they are ripe and 'cheesy'. The vet may also administer antibiotics. An ear bitten in a fight, and bathing gently with a cotton bud dipped in saline solution. Bald patches. If starting on the face and looking pale and scaly, these may be caused by ringworm. Itchy patches may be a sign of mange. A bald patch in the middle of the back that neither spreads nor itches may be the result of an over-rich diet. Reduce pelleted food and offer more green-stuff and hay. If patches persist, seek veterinary advice. Constipation This may be due to disease, lack of rough­age, or too dry a diet (perhaps with too much cereal and pellet food), fed without sufficient water. Diarrhoea Diarrhoea may be due to an intestinal infec­tion, introduced by way of contaminated or frosted veg­etable matter, or due to a sudden change in diet. If it persists or occurs with other symptoms, advice should be sought. Flystrike (see rabbit section for more details) Long-haired guinea pigs can suffer from the 'strike fly' which lays its eggs in faeces-soiled fur. Within 12 to 24 hours, maggots hatch out and eat their way into the animal's flesh, with fatal results. All guinea pigs should be checked daily to ensure their coats are faeces-free. Hutches should be cleaned and bedding changed daily. Hair stripping. This abnormal behaviour, when guinea pigs strip their own hair as far as they can reach or strip each other, tends to occur in the long-haired breeds. Some young are made quite hairless in this way by their own parents. The cause may be boredom and, in particular, the lack of something to chew. This is one reason why it is essential to give guinea pigs as much hay as they will eat, and to keep them in pairs or small groups in as interesting an environment as possible. Loss of balance A guinea pig which holds its head to one side and which may veer round in circles, quite unable to walk in a straight line, is showing symptoms of middle ear disease and professional advice should be sought. Frequent observation of your guinea pig's condition and behaviour is the best way to spot any health problem before it progresses too far. Parasites. Guinea pigs are usually free of parasites unless there are infected cats and dogs, for instance, in the house. They may, however, become infested with lice, perhaps from infected hay or straw. Either bath the guinea pig with a medicated shampoo or treat with a mild insecticide powder. Repeat the treatment once a week, and if in any doubt or difficulty, seek veterinary help. Pseudotuberculosis. Enlarged glands in the neck and growths in the abdomen may be caused by a serious condition known as pseudotuberculosis. Sometimes death is rapid, but variations of the condition may cause a slow deterioration in the guinea pig over several weeks. This is a highly infectious disease and veterinary advice must be sought. Respiratory infections. Symptoms similar to those associated with the common cold in man are made worse by poor living conditions, and can develop into pneumo­nia. Rehousing the guinea pigs in isolation in a dry, warm and roomy cage will often bring about an improvement and stop the spread of these respiratory infections. If in doubt or if the symptoms persist, do not hesitate to seek veterinary advice. Salmonellosis. An organism of the salmonella group causes rapid loss of condition followed by collapse. This very serious disease has a high mortality rate and spreads quickly through large colonies. Veterinary attention is vital because the most rigorous cleaning and disinfecting is necessary before it is safe to introduce new stock into the accommodation after an outbreak. Animals that do survive an attack may act as carriers and cause subsequent outbreaks. There is also a hazard to human health, and there fore particular care over personal hygiene must be taken. Vitamin C deficiency. Guinea pigs, and especially preg­nant sows, have a particular need for a high daily vitamin C intake. A deficiency may lead to scurvy, and a loss of resistance to other diseases. Pellets fed without a variety of fresh vegetables and fruit, or those prepared for other animals, may not contain enough vitamin C to meet this need. Guinea pigs not feeding adequately because of over­grown teeth may not take in enough of the vitamin, even though the right foods are available to them.